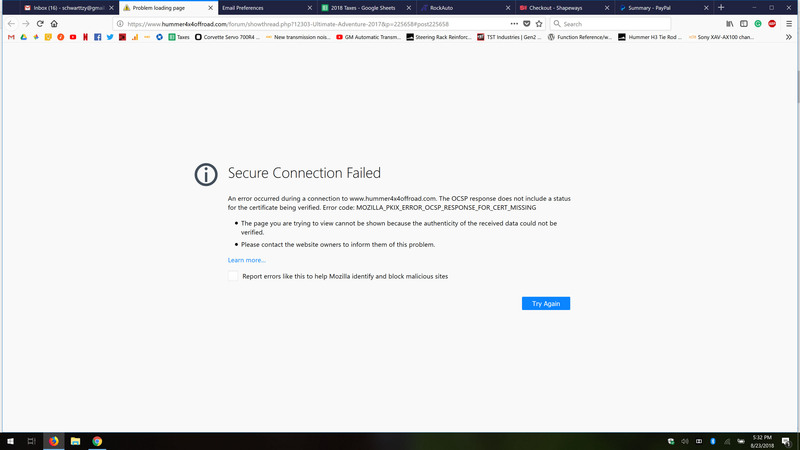 Here's the error I keep getting when browsing with Firefox. I'm glad I'm not the only one. The site pops up like a text or bulletin board when I'm in Firefox so I use Edge which I'm not really thrilled with. Wow yeah me too! I didn't want to say anything because I thought one of my add-ons was causing the problem. As a work around type 'about:config' into your Firefox address bar, then search for 'security.ssl.enable_ocsp_stapling' and double-click it and change its value to 'false'. This should be considered a temporary fix until the site is fixed. SO EXCITED! Thursday I will be looking at a Unicorn of H3 Hummers. It's a Luxury, Adventure, Alpha that looks exactly the same as my H3 Hummer! Which means I'll just swap over the parts. Also it only has 7k more miles than the one I'm driving. Should have less rust too. Nice!!! What year is it 2008, 09' or 10'? Any plans to fix the Firefox issue? Bump. Any updates or should I just keep using Opera? I do plan to address this but I have not had time. My apologies. Please continue to use your workarounds for now. I do not have an ETA in part as I do not know the root issue. When I try to pull up one of the column titles on my Android phone I get a message that this site has been identified as a security risk. ??? I thought I'd add that in. The issue is likely that you're not redirecting http to https. The risk is that some users will be using an unsecure connection if they've bookmarked http://www.hummer4x4offroad.com instead of https://www.hummer4x4offroad.com for example. That would force all links to the site to be https (secured) which might fix the Firefox issue. Maybe worth a shot. It works on Firefox! Thanks Alex! I created a new bookmark and deleted the old one.